Vilhelm Parfumerie is a new fragrance line developed by founder (and former-model-turned-designer) Jan Ahlgren in collaboration with perfumer Jérôme Epinette. I know, I know — another week, another niche perfume collection. It's the new normal, and all I can do is try to keep up. I've tried three of Vilhelm's eight fragrances, aiming for the ones that sounded most suitable for spring and summer, and here are some short reviews. Opus Kore is a fruity fragrance with notes of Sicilian lemon, acai, raspberry blossom, pink magnolia, violet leaf, sandalwood, skin musks and crisp amber. Its name alludes to Persephone, also known as Kore, the goddess of spring and fertility. I enjoyed this one. Its blend of tart and sweet fruity notes reminds me of pomegranate, which would suit the Persephone theme. The lemon and (to a lesser extent) the magnolia also catch my attention, and the dry down is a transparent amber that still retains hints of fruit. It's a fun warm-weather fragrance, and my favorite of these three. Room Service is a fruity floral with notes of mandarin nectar, blackberry, pink orchid, green bamboo, violet, black amber, musk and sandalwood. It's meant to evoke a movie star like Garbo enjoying the solitary luxury of her hotel room, and it's the most feminine of these three Vilhelm scents, but it doesn't really have a rich or classic feel. The blackberry note dominates. There's a whiff of something very clean that reminds me fleetingly of hotel sheets (I'm very suggestible! ), but I'm left hoping for the flowers or "black amber" to emerge further. Room Service has decent longevity, but the dry down is a sharp skin-musk scent that just doesn't sit right with me. Morning Chess was inspired by Ahlgren's memories of summer holidays with his grandfather. This is the green fragrance of the bunch, with notes of bergamot, Tuscan leather, galbanum, patchouli and dark amber. It's more traditionally masculine (and more sillage-heavy) than Opus Kore or Room Service, and it feels (to me) like a contemporary version of a fougère: lavender up top (although it's not included in the official list of notes), with some bright galbanum and moss underneath. The leather note is very subtle. I'm not an expert on masculine fragrances, but this one seems focused and well-done. In some ways, Vilhelm Parfumerie reminds me of Byredo, another well-packaged niche fragrance collection. Epinette has worked with both brands; I happen to prefer his creations for Atelier Cologne, overall, but maybe that's just a question of taste. I just expected something more for this price point; however, Vilhelm is reportedly selling very well in London. Have you had a chance to try the collection yet, wherever you are? What did you think? 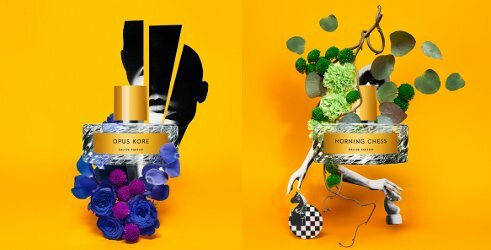 Vilhem Parfumerie Opus Kore, Room Service and Morning Chess are each available as 100 ml Eau de Parfum ($245) at Barneys in the US, Liberty in the UK and Colette in France. I haven’t tried any of them and probably never will. I do, however, like the name and the notes of Morning Chess. I like the names and the concepts, too, and the visuals are really clever! Thank you for the reviews, Jessica! I’m curious about this line, but I’m afraid your comparison with Byredo might be spot-on: I love the aesthetic and concepts of that brand and like the fragrances, but don’t quite love them. Pulp is the only one I really want to own (I’m burning Carrousel, the candle version of Pulp at the moment and I adore it). Still, I’ll definitely try Vilhelm Parfumerie next time I’m in London. Exactly…none of the Byredos have really “clicked” for me, although I liked Gypsy Water quite a bit when it was first launched. Pulp must be great as a candle! I liked Morning chess, it’s a nice enough transparent patchouli ( I have a soft spot for patchouli) and then Stockholm 1978 cause it’s abstract enough to catch my attention. In general though the whole line follows current trends and the price point is unjustifiable. I paid 145£ for the absolutely brilliant Eau De Magnolia. But then again it’s just me..
Prices have gone so high for niche lines..it’s ridiculous. I used to pay a lot for Caron parfums (before 2006 or so) and I still will for Lutens, Malle, et al., but otherwise… I don’t know. I’m visiting New York on Saturday and I’ve done my research for perfumes I cannot find here and so far, most of the stuff which tickled my fancy retail at 150 dollars and up sky high.. I do understand that niche holds a certain luxurious character but things were so different 5 years ago. I paid 96£ for Heeley’s Sel Marin 3 years ago and now it retails at 120£.. What is exactly different? It’s probably just because they can, or because they think it will lend an aura of luxury, but I also I wonder if there are some new costs such as reformulation to meet IFRA requirements or increased shipping costs related to security restrictions. So hard to know. All of the above, probably! From what I have read the actual cost of a bottle of perfume is incredibly low by comparison to what we are asked to pay. I completely agree with nozknoz, the companies can charge exhorbitant prices under the assumption that we will pay, no matter what the cost. And we do. I know of many individuals who do not live a “luxurious” lifestyle, yet would save their pennies to buy an expensive niche perfume. Tried these at Barneys today. Well made and the bottle and packaging are just so chic. None of the fragrances really captured me although I found Stockholm 1978 very appealing. I ended up getting Lumiere Blanche from Olfactive Studio, what a delicious scent. They really did a great job with the packaging. I love the box designs. I’ll never get a chance to try these but I’m charmed by the idea of a ‘room service’ perfume. I’ve been entertaining myself wondering if it should be a lipstick and powder puff scent, or something to do with oysters and champagne? Or perhaps a perfect peach (out of season)? Out of my collection I’d nominate Piguet’s Baghari as a room service perfume. It certainly has a rich, classic, very feminine feel. I love it but don’t wear it out of the house much. It seems to demand a satin negligee and slippers with pom poms! That’s a great choice for a “Room Service” fragrance! Lipstick Rose is sort of room service-ish… so is Carnal Flower. I think some gourmand niche scents, e.g. Scent by Alexis, would also work well as more downtown room service fragrances! Like you these really remind me of Byredo in aesthetic. I haven’t tried them but I know my friend who likes nice things and wears Diptyque and likes Byredo perfumes thought these looked great and was tempted to buy without trying from the look of them. I advised that it was a lot of money for a blind buy and that she could probably get something for less money that is far superior in quality (although I hadn’t actually tried them but this was more of an assumption by myself after experience of trying new perfumes). But I think there is definitely a group of consumers who like what I term fashionable upmarket perfumes e.g. Byredo that will really gravitate towards these due to the packaging. I’m just a bit more cynical that they won’t justify the price for me. I personally am finding the pricing behind niche perfumes astounding as they are all going up. I used to think Malle was expensive but now I”m starting to believe that they are great value as a lot of the new brands are nowhere near as good as this range but are charging more! But people will pay anything and I think new brands know via their consultants that if they’re launching in the market now they have to price high to be seen as niche and aspirational. It’s as simple as that. And I went to an art gallery yesterday and the owner was saying that he was finding that a lot of new customers loved what he had and the artists he stocked but wanted more expensive art works – the prices weren’t high enough for them. The piece in the window was 150,000 Euro so to me the prices were look only (LOL) but I think it’s a similar phenomenon as far as mind set goes. Excuse the long comment but it’s been bugging me a bit lately! Price is a marketing strategy. It plays on the assumption held by many people that if something is costly, it must be good. Of course we all fall for it from time to time, but when it comes to any perfume over $200, I generally don’t have any trouble restraining myself! Same here… I don’t buy as many bottles as I used to, and the rising prices have been a factor in that decision. I tried Stockholm 1978 at Barneys NY last week. It’s my favorite along with Black Citrus. The opening was really nice, but then it fell flat into a generic Patchouli base that you find in a lot of popular fragrances. Overall it’s the same problem that i have with Byredo (they had them side by side at Barneys) that they seem appealing in the first half hour then they really die down. The ad campaign is really well executed, but so are Kenzo’ ads for quite a bit less pricey. At this price point, I would go with Memo for awesome designed bottles, or Frederic Malle, Le Labo, Amouage for quality, or something more contemporary like Scent Stories line from Min New York. A funny thought, the sale assistants all describe these scents as clean and refreshing, which is a generic description in itself, i also got that same line from Creed and Byredo sale people.